This is the main page for information pertaining to our parish church, Saint Mary's Assumption. The SSPX's Gateway of the West's chapel had its beginnings in the 1970's with a small group that had Mass occasionally celebrated in their basements and then later every other week at a Holiday Inn. In 1979, the SSPX purchased the present Queen of the Holy Rosary Academy complex, formerly an elementary school in the Lindbergh School District, whose auditorium served as the chapel from 1979 until 1997. The complex, in addition to acting as the parish's chapel, school and priory, also served a brief stint as the SSPX's District Office in the United States, until the headquarters' moved in 1990 to Kansas City, MO. The parish also had the distinct privilege of playing host to the visit of Archbishop Lefebvre twice, once for the dedication of its chapel (when it was in the auditorium) and in 1985 when he came to administer the sacrament of confirmation. Over the years, the parish made several attempts to obtain an actual church building, but due to the high costs of new construction, these were all thwarted. 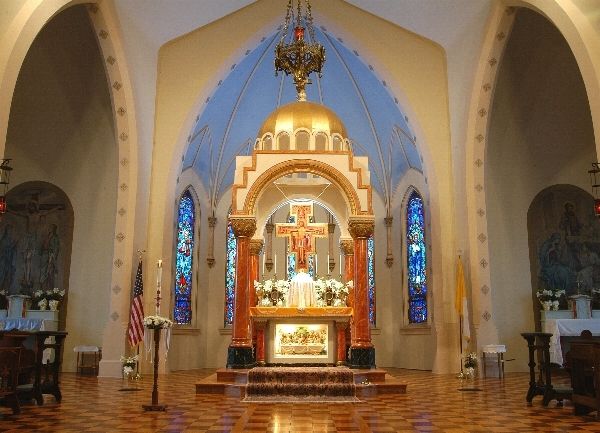 Finally though after nearly 20 years of waiting, it was announced in August, 1997 that the parish had successfully purchased the beautiful church of St. Mary's Assumption, formerly of the Catholic Ruthenian Rite in downtown St. Louis, but only 15 minutes away from the academy complex. To date, the chapel numbers over 300 faithful and has 55 students enrolled in its academy.